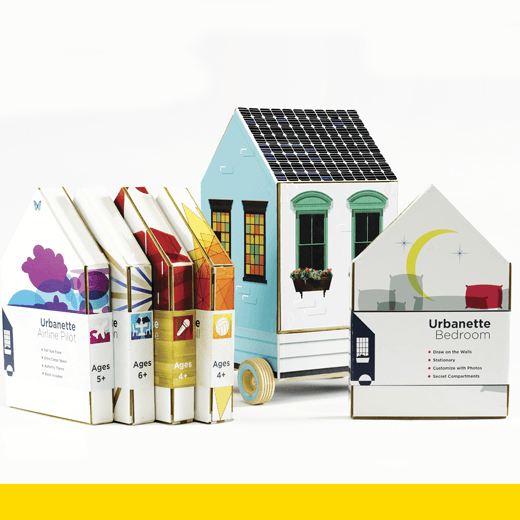 The Urbanette is a patent-pending design for a modular tiny-home dollhouse that lets kids make believe anything, anytime, anywhere and with anyone. Just larger than a Happy Meal, it carries up to five collapsible rooms that unfold into any space imaginable, from kitchens and bedrooms to stages and airplanes. The modularity allows rooms to be replaced, swapped with friends, collected or returned. Thus a child can update the content of their perfect make-believe home to match their rapidly changing interests. With its biodegradable plastic construction, parents can replace rooms without the guilt of excess waste. The collapsible design means more efficient product shipment, shelf display and user storage. The portability means kids can take their dollhouse on the go. Playing with this tiny home will introduce kids to the experience of sustainable living so they can become the responsible adults of tomorrow.